I’ve said it before and I’ll say it again, maybe my mission to Haiti should have been to simply clean up the messes that other NGO’s and mission teams left behind. If anyone ever decided to form an organization with that precise mission they would quickly become one of the busiest and most needed organizations in the world. Sure it would not be a very fun job, just ask any mother of a teenager or the hospitality staff of the hotel Justin Bieber stayed at last night, but someone’s gotta do it. Unfortunately, anymore it seems that some organizations have taken on the Bieber mindset of “me and my monkey can do what we want with our good intentions, someone will clean up after us.” (Yes I know the Biebs doesn’t have a monkey anymore, so don’t leave comments telling me to check my facts. It’s a metaphor to make a point.) And the point is, that some organizations have become too big to fail or too famous to do any wrong. They’re doing enough other “good” things to distract everyone with that when they really eff something up no one notices and they don’t have to be held accountable. But the people who were supposed to benefit from their previously well intended failures sure notice. Those individuals have no voice to speak with, however, which is probably why they needed the organization’s help in the first place. Yet, one thing I’ve found to be true is that the most marginalized groups in society, being the most experienced in getting screwed over, will fight harder than anybody to right the wrongs that have been perpetrated upon them even if they have to do it themselves. Even if it means giving the finger to big orgs and showing them where to shove their good intentions. The truth is that many nonprofits will raise funds based on ideas that they promote as certainties even if they have no idea how it’s going to work out yet. Then when they give it a try and it doesn’t work out, or they find out that their idea wasn’t really the best in the first place, it’s no sweat off their backs because they can just use the money for something else “good” and no one cares. But with the expectations raised in communities that they had planned to help, they leave in their wake disappointment, feelings of betrayal, holes in communication, and foundations of projects that will never be finished. The community also loses faith in aid which makes it very difficult for other groups to find local support for their projects. Then someone else has to clean up their mess or their failures will just be interpreted by future humanitarian groups as problems of the culture that need to be fixed. They tell everyone that they are going to do great things with that 100 grand that they raised but now it’s going to take twice as much to fix all of the problems that they cause along the way. Once upon a time an earthquake struck Haiti killing hundreds of thousands of people and leaving millions homeless. It also left many children orphaned and others sent to new areas of the country where they didn’t have schools available or their extended family that was now in charge of them couldn’t afford to send them to the schools that were available. At this time, the foreign leaders of an international organization (which shall remain nameless) decided that because of this situation they would build an orphanage. Of course, because there’s lots of orphans, why not? So they threw a dart at a map of Haiti and it landed in my community of Mizak. So they contacted their Haitian staff and told them that they’d decided to build an orphanage in Mizak due to the needs left after the earthquake. 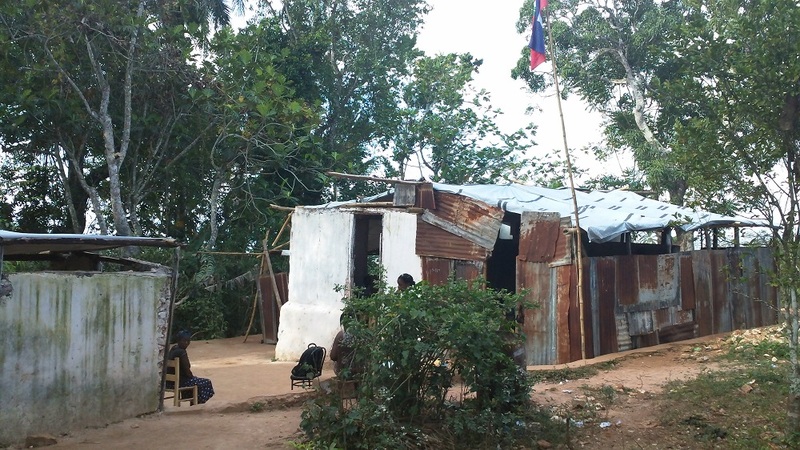 After the Haitian staff assessed the community and talked to many people who lived there, they decided that it wasn’t actually an orphanage that the community needed, but a school. Either way, they’re helping kids in need, right? So they went ahead and began making plans to start an elementary school. They registered over 150 children, hired a staff, and threw them all into a hellhole of a building and told them to start learning. Orphanage? School? Who cares. Let’s put it here. This looks perfect! After three months of classes, the teachers hadn’t been paid, the students didn’t have books, uniforms, or supplies, the benches were falling apart, and Christmas break was almost here. Turns out that the NGO refused to support the school because it wasn’t the orphanage that they wanted to build. The Haitian representatives spent months trying to convince them that a school was in the best interest of the community, but eventually they had to throw in the towel and admit defeat. They were ashamed to admit it however and left the school staff and students to believe that they were going to have a legitimate school. Eventually the staff figured out what was going on and had to start looking for a way to save the school year for these kids and clean up the mess that was made. So where did they look? The only other organization in their community that had anything to do with education. When the staff members knocked on my door that day I knew what they were there for before they ever uttered a word. In my heart I cursed the circumstances that led them there. They were all students of mine from the other classes that I taught for young adults at Living Media and I knew that I’d have a hard time telling them no. But I did that first day, “My organization doesn’t do elementary schools.” I told them. By the second time they visited me I grew weaker, “Well maybe I can find some temporary help for you.” By the end of the school year I was having meetings with my own Haitian staff and Board of Directors to explain to them whey I thought Living Media should adopt this school. After one year of non-committal support, we were making plans for the future including the construction of a new school. And that’s where we are now. Taking on a project that we never thought would be part of our mission but doing it because we couldn’t allow such an unfortunate burden to be dumped on our community in the name of aid. Cleaning up someone else’s mess. And as someone who never came into the country to build schools for kids, because that’s what everyone does, and because there are already so many schools, some days I really hate that I have to deal with this responsibility. (There I said it.) But there are other days when I am truly thankful that it fell into my lap. Again, you can ask the mother of a teenager how much she hates picking up the dirty laundry, but in the end she counts it as a blessing every day. So, now that you’ve read all of that, you have to accept my plea for help, which I usually try to avoid on this blog, but I’m making an exception this time, because it wasn’t supposed to be my project in the first place. And maybe life’s just too short not to build a school. So, if you want to help us finish building this school, you can head over to our Indiegogo campaign that we have up right now. I’m asking the readers of The Green Mango Blog to donate not because “Education is the key to success,” (although true) or because “Children are the future,” (also true) or any of those other fundraisy things that I say in our promotional video, but because these kids are human beings and they don’t deserve to be treated like NGO lab rats, the victims of humanitarian experimentation gone wrong. Donate to send a message to the bigger organizations that their failures don’t define us. Help us build this school because you’ve probably got a few extra bucks in your pocket and you’re not going to do anything that important with it anyway. Might as well give it to our school, and get one of our awesome perks for your gift. If you’ve got more than a few bucks to give you could even receive dinner with me and the principal of the school, or a personal guided tour around our community and a stay at our guest house. And who wouldn’t want that? Don’t make me post a picture of a sad, skinny, dirty child to make you donate. Thanks. We didn’t come here schools either, but then we had our own children… When our oldest turn four, we had to make a decision: homeschool, send them away to school or start a community school of the quality we want for our children. We did the latter and never regretted getting into education. All our children are grown and gone, but we are staying with the education aspect of our ministry. This is graduation season when we get to rejoice with all the families of our graduates. Hope you enjoy it as much as we have. Also, what is the name of your guest house?